Majority of network administrators still can't make head or tail of Wi-Fi networks. Whereas deploying or managing of such a network doesn't really demand any efforts, the troubleshooting procedure usually turns out to be a formidable task to cope with. 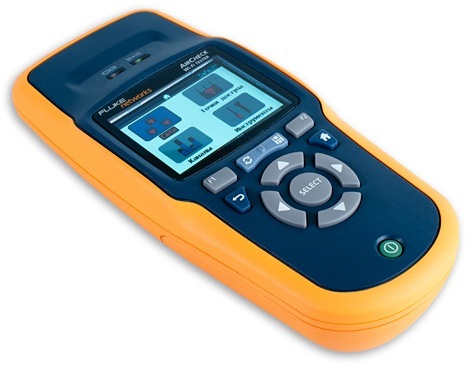 Fluke AirCheck Wi-Fi Tester was made to simplify carrying out any of those activities connected with wireless networks IEEE 802.11 an administrator have to deal with. Let's now inspect its capabilities. 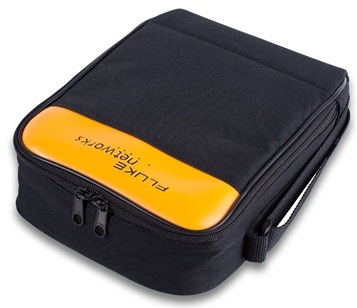 Fluke AirCheck is sold completed with a soft middle-sized bag that makes it easier to carry the device around. The device is performed in a two-colored plastic case with dimensions 8.9x19.8x4.8 cm. A Wi-Fi Tester weights 400 grams, with the large part of it accounting for a plug-in unit of lithium-ion batteries (18.5 watt-hours). 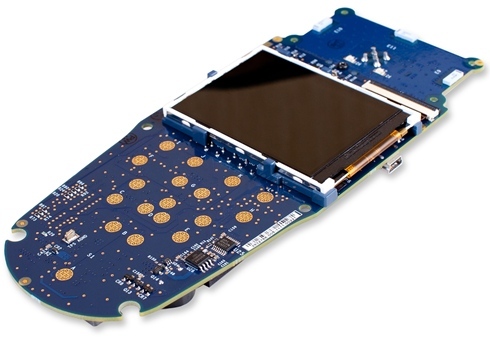 There is a small LCD panel and twelve control buttons on the front panel of the device. Also, there are two LEDs, one of them shows whether the device is connected to a wireless network, while the other one shows the data link activity. On the side face of the device there is an external power supply connector (15W) with an indicator light next to it, as well as a USB-port to connect the tester to a PC or notebook. The plug-in unit of batteries takes half of the backside, whilst on the other half there is a connector for an external beam antenna. 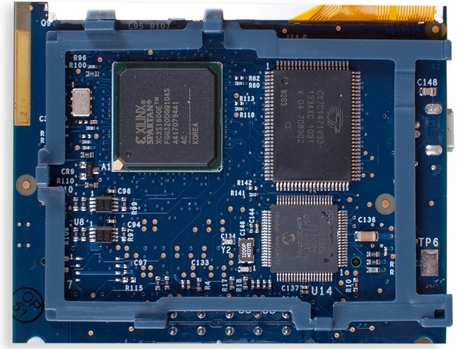 On the main card there is a speaker and LCD display which covers three large modules, and they are an FPGA XILINX XC3S1600E, Microchip PIC18F87J50 chip, Cypress CY7C1471V33 RAM module, and a connector where an ATP MicroSD 512 Mbyte plug-in flash memory card is connected to. Fluke AirCheck Wi-Fi Tester has its younger and elder brothers, they are an OptiView XG network analysis tablet and an AirMedic USB entry-level RF spectrum analysis device, correspondingly. 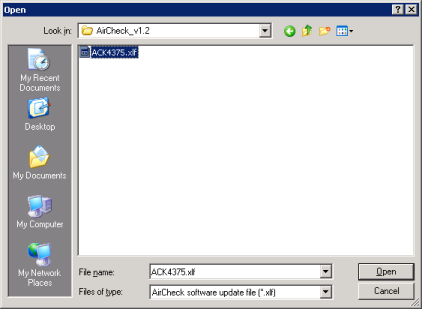 Firmware upgrade and changing of certain settings are carried out using AirCheck Manager utility which is installed in common to majority of users Windows mode. We won't be getting deep into reviewing all of the features of this utility and will only give you an insight on the most interesting ones, as we believe. 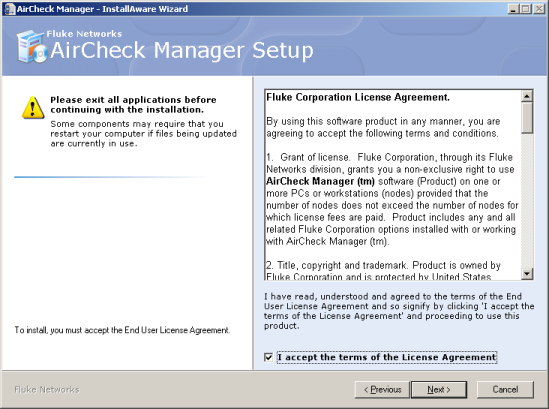 Straight away after an AirCheck device is connected, AirCheck Manager utility will detect the device and provide an administrator a brief information on it, like serial number, MAC address, software and radio module versions. All data presented above can be found in Session Details tab. Access Points tab shows us the list of access points and wireless routers detected, furnishing us with detailed information on each device. 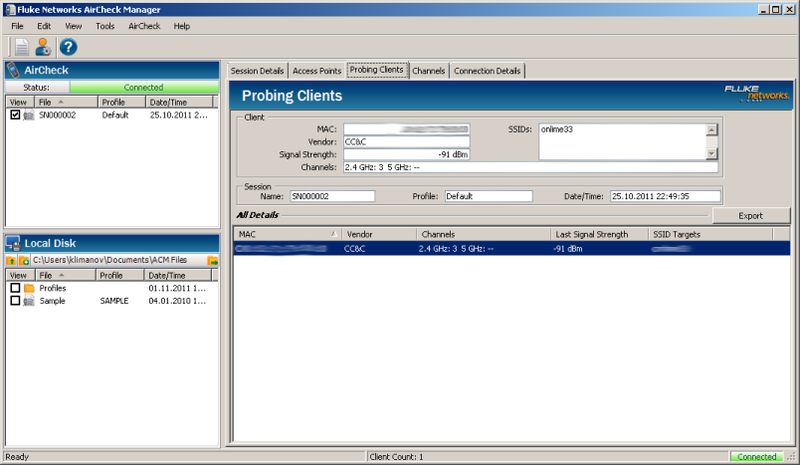 Information about Probing Clients can be found in the similarly-named tab. 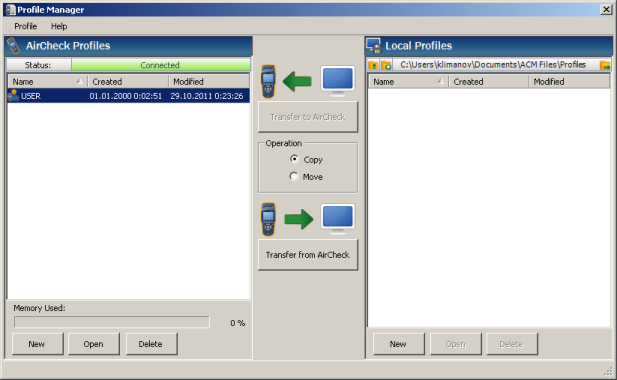 Information about the device can be also found in menu item View Information in AirCheck menu. Data on wireless channels of both frequencies are presented in Channels tab. This is where you can receive all necessary information on utilization of the channel, its frequency, number of access points, duplicated SSIDs and so on. 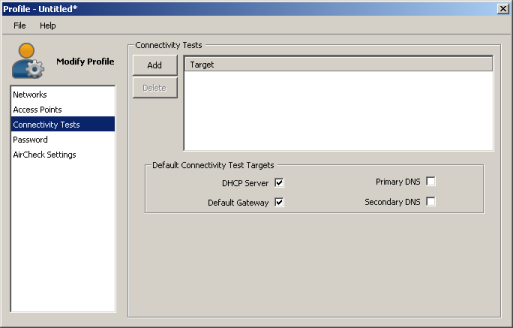 Connection Details tab is meant for showing us the parameters necessary for connection to a wireless network, and they are SSID, IP configuration, connection speed and so on. Also you can check out the connection details. 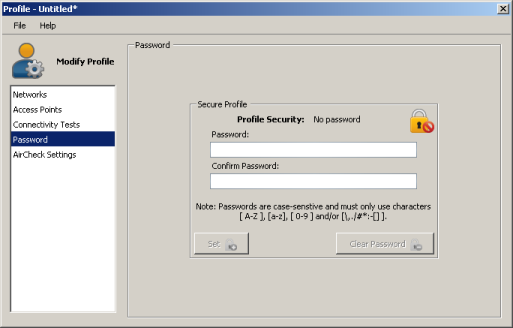 Apart from the data captured by the tester, an administrator can also manage profiles (using menu item Profile Manage which is located in Tools menu) necessary for a testing connection to certain networks and checking their connectivity. Almost the same can be done by clicking Open Profile and Add APs/Networks buttons which are located in Device Information tab. 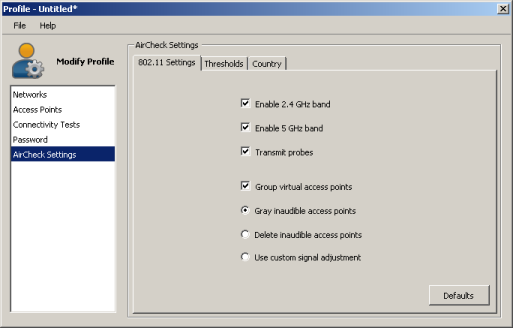 Security parameters can be managed only by using AirCheck Manager utility; they cannot be altered using only the wireless tester on its own. We believe it to be a disadvantage since it doesn't allow you changing an array of important parameters on-the-fly (i.e. while in the field). 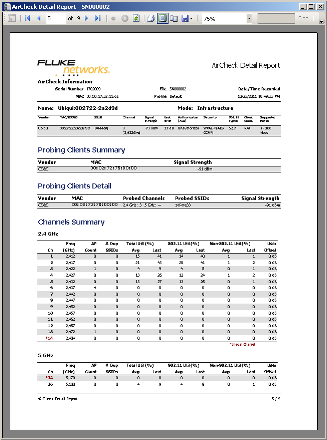 Another interesting feature of AirCheck Manager is report generating which makes it possible to save all the data received by a Wi-Fi tester as XLS or PDF files. 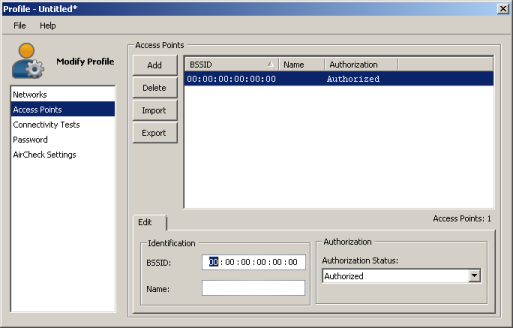 These reports can come in quite useful upon certification procedure of a wireless network created; to generate one you must enter Reports menu item in File menu. 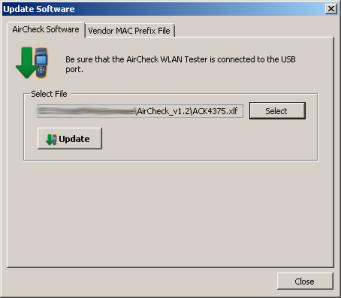 Also, you can upgrade the firmware and the list of MAC address vendors of network equipment using Update Software menu item in AirCheck menu, AirCheck Manager utility; to do that you only need to select the file with new firmware and click Update button. The whole upgrade procedure takes about three minutes. 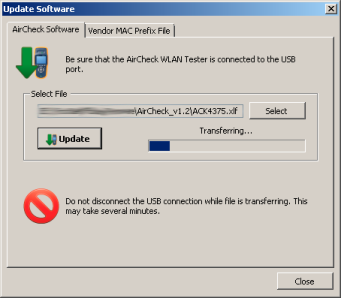 Firmware upgrade can also be done without using AirCheck Manager utility. You only need to save the file with a newer firmware to the root folder which goes first while connecting the device to the PC via USB. Now let's pass onto reviewing functions of an AirCheck tester. 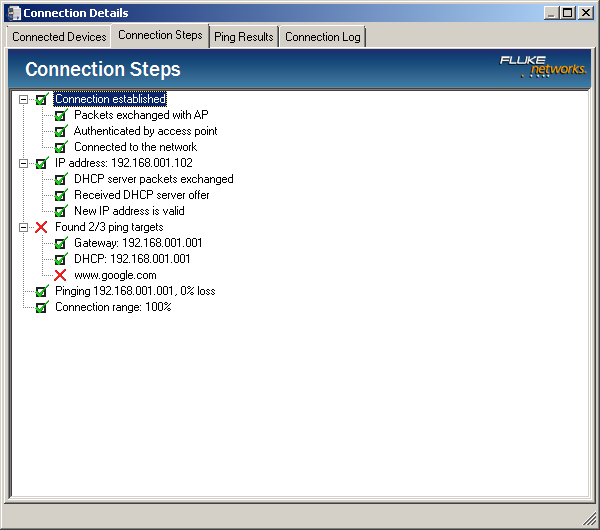 When a Fluke Networks AirCheck Wi-Fi Tester is turned on, there are four sections being displayed, and they are Networks, Access Points, Channels and Tools. Let's examine the features they offer us. After accessing Networks section a user is being shown the list of IEEE 802.11 a/b/g/n wireless networks available within the coverage area of the device. Each SSID detected is displayed together with the date and time it was first detected, authentication status, signal level, encryption type used, the number of APs with the detected name of the wireless network, supported standards of 802.11 group, and notes. Notes tell an administrator about noise level in those channels used, country codes mismatching, usage of several types of information security control and so on. 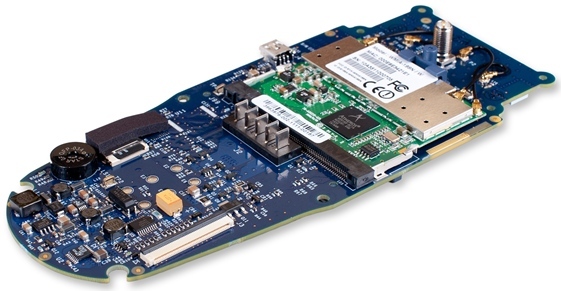 All of these things have certain impact on both the operation speed of wireless clients and the quality of their connection to an access point. Country code mismatching upon configuration of an access point leads either to technical slip-ups in a wireless network operation or to some problems of legal nature due to the differences of permitted frequencies of channels in various countries. Upon accessing Legend soft button a system administrator receives supplemental information on those legends used. Such a feature may be quite useful since any other electronic or paper guide can be unavailable at the moment. Apart from detecting wireless networks, this portable tester can also try to connect to them. Although we should note that this kind of connection would only be possible if the network selected has a preset encryption key. 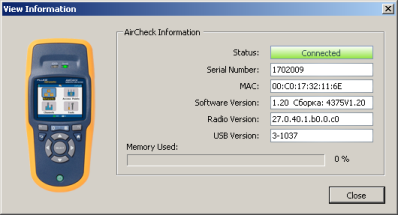 In order to set the key the AirCheck must be connected to a PC. We believe that the option of encryption pass setting without being connected to a PC would make the device much easier to use. There is additional information provided on each of those networks detected. 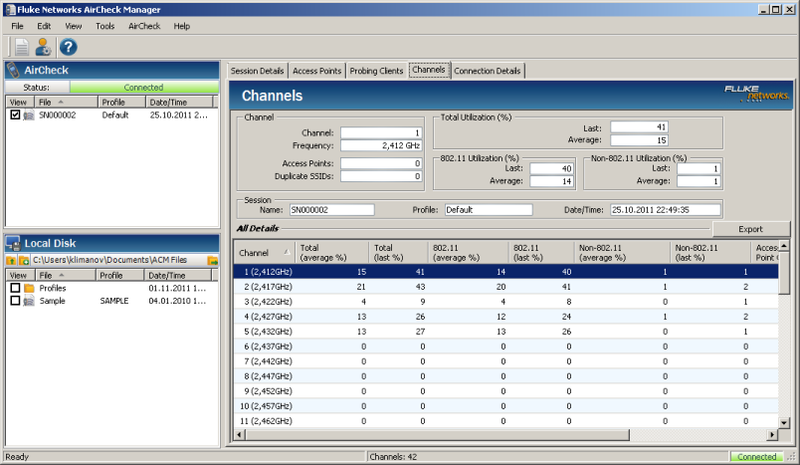 Also, an AirCheck Wi-Fi Tester can display a graph of channel usage where the selected access point operates in. AP Location function allows locating the spot where an access point was set. The procedure itself looks like something similar to ARDF (radio orienteering); the device is changing its beep tone while close to the AP. We can't help mentioning an external beam antenna incorporated in the device which greatly facilitates the whole process. 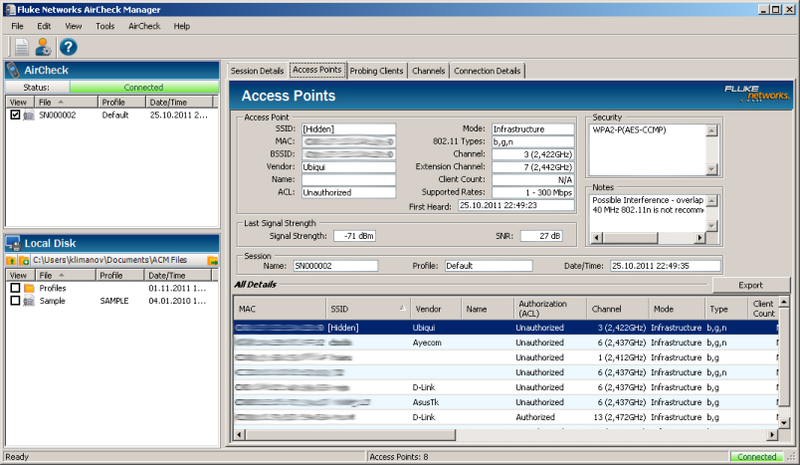 Access Points section provides us with information similar to the one we have already seen in the previous section. The only thing is that the APs aren't arranged by their SSID, but directly by the device name with the channel mode of the wireless network where this device operates in. 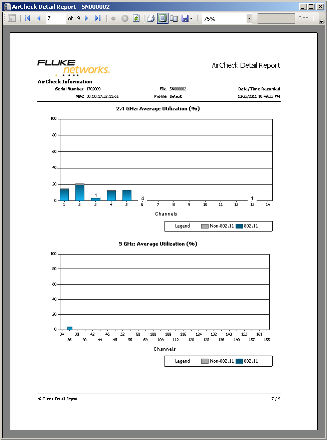 A Fluke Networks AirCheck Wi-Fi Tester makes it possible to display usage of both IEEE 802.11 network standard channels, as well as of non IEEE 802.11 standard ones, for each wireless channel on both frequency ranges. Also, the list of APs operating in the selected channel can be received. The only section that we didn't see into was Tools which offers us an opportunity to both manage settings of the device and receive advanced details on the wireless network operation. The first menu item in the section is Clients. 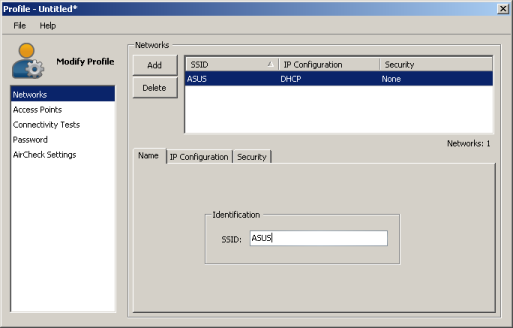 Using this item a system administrator can both receive the complete list of Wi-Fi clients and identify their location. 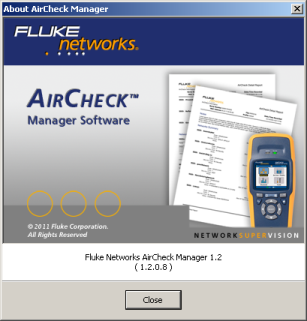 Files menu item is meant for loading, saving, renaming or deleting Fluke AirCheck Wi-Fi Tester profiles. Enabling/disabling of range support and other 802.11 network settings are located in 802.11 Settings item. Threshold setting is made using the similarly-named menu item. The interface of the device is available in several languages; the complete list of languages is situated in Language menu item. 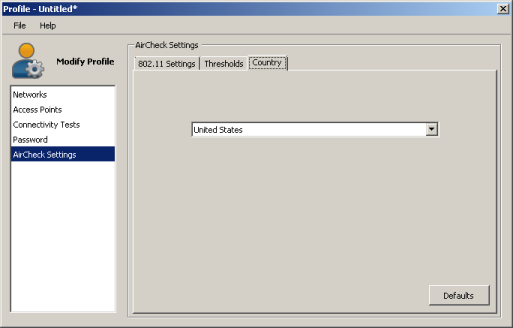 MAC-address, serial number and program module versions are presented in AirCheck Information menu item, meanwhile Power is used in order to disable or enable auto shut-off (in 10 minutes) function. That's where the performance review of Fluke AirCheck Wi-Fi Tester comes to an end and we pass directly onto the testing procedure. The first thing we began our testing procedure with was search for available wireless networks within reach of the device. It turned out to be that they were more than we thought. A certain company owned the building our testing process has been carried out at, therefore we knew where all the access points were located well beforehand. Anyways, two of those networks detected had really high signal strength, and that was not on our agenda at all. We decided to find the physical location of the wireless network equipment. The results of this search became an unpleasant surprise for system administrators; it turned out that some users have been setting up unauthorised wireless routers in order to connect to the Internet using their personal notebooks and other gadgets. We have even detected an unclassified network with no access limit set. The inspection made allowed us to locate those unauthorised networks, deactivate all illegitimate devices, warn users that any possibility of such activities will be further ruled out, and enhance security of the enterprise network. Also, as a result of the testing, we have identified which ones were the poor signal spots and afterwards designed the coverage map of the enterprise wireless network. 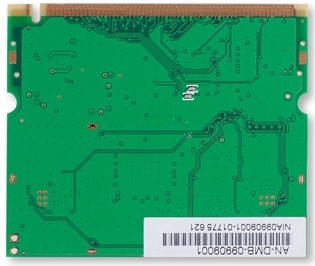 Following the analysis of this coverage area map, system administrators managed to find out what the most sensible layout of the wireless devices was, thus improving the quality of coverage in problem areas. However, there was another wireless network which positioning became a top-secret for us. The answer was its name (SSID) and it turned out that the AP was situated in the nearby house, the two buildings only separated off with the school grounds. 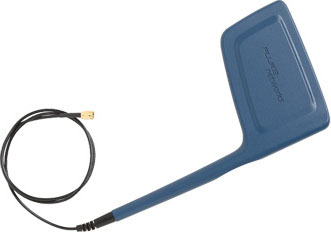 Owner of that AP set up a directional antenna by his window and pointed it to the school where he was having a walk with his children from time to time, together with a pocket PC in hand. We got to know each other (using wireless client search option) and, being quite surprised by the unexpected encounter, he obediently accepted the fact that he had to change the wireless channel he used with the equipment. Naturally, we just couldn't lose the opportunity to get connected to our network and check its IP-connectivity. 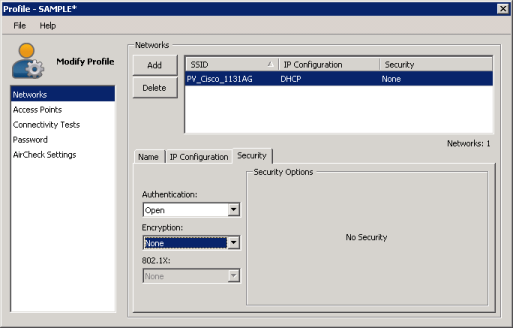 The only disadvantage we found was inability to specify the network key directly using the Fluke AirCheck; to do that one must have the device connected to a PC or notebook. 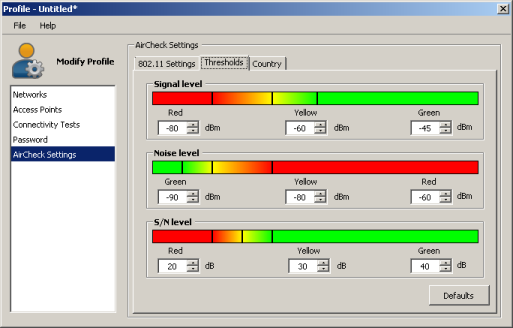 Given that the AirCheck Wi-Fi Tester provides details on both Wi-Fi signal sources and the rest of those signal sources within the range of 2.4 and 5 GHz, we have decided to prove the widespread belief that microwave ovens affect quality of a Wi-Fi network signal. At first we checked the outfit while the microwave was off, but then we put it on and checked status of channels once more. It appeared to be that that while the microwave is on, there is a lot of noise in the Wi-Fi channel that can either affect the transmission performance or even shut the connection off. We also decided to get the activity graph of a certain channel while the microwave is either on (left-side on the graph) or off (right-side on the graph). When the noise source was on we have been walking about the office which had its impact on the performance of non Wi-Fi noise (presented by a decreases in the left part of the graph). Doing the troubleshooting this way, a system administrator will always be able to detect the noise source of non IEEE 802.11 standard devices. Our testing is about to be over. Now let's strike a balance. After our get-together with the Fluke Networks AirCheck Wi-Fi Tester we believe that it's a nice device which is a must for the system administrators engaged in build-out and maintenance of massive IEEE 802.11 wireless networks at business centres, expocentres, campuses, office blocks, that is at places where there is a large number of wireless devices, but availability and security of the Wi-Fi network are crucial. 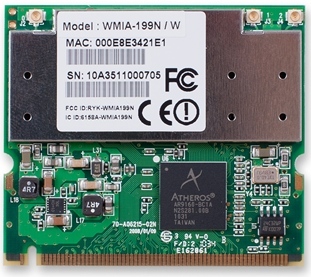 This is an essential tool to be used upon certification process with Wi-Fi networks being put into operation. Advantages of the device there are as follows. However, its drawbacks cannot be missed. 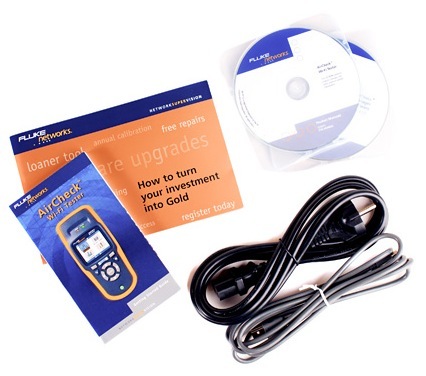 The suggested retail price of a Fluke Networks AirCheck Wi-Fi Tester in November, 2011, was 84,082 RUR. The author and editorial team return thanks to an official distributor of the Fluke Networks in Russia, Tayle company, for the testing equipment provided.